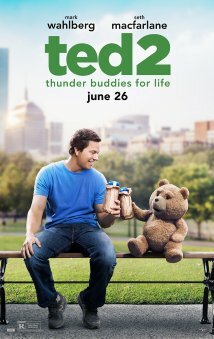 Seth Macfarlane does it again and brings smiles and laughter with the voice of Ted in a sequel worth seeing. If you haven't seen the first one, however, I probably wouldn't suggest it. A friend went with me and by not seeing the first he didn't really enjoy it. I heard him laugh at some scenes but all in all he was not a big fan. There were a lot of inside jokes in the first half of the movie that you wouldn't get if you hadn't seen the first Ted. The last half was rather boring and really dragged out. Even though some critics say this was better than the first I would disagree and say otherwise. But give it a chance if you're a fan and go see it. The story follows Ted and John (Mark Wahlberg) from the first but now we see Ted getting married with Tammy Lynn (Jessica Barth) and the after effects of that marriage. It's not so happy so they decide to have a baby and from trailers, that's when it gets funny, including a Tom Brady cameo. When finding a donor for the baby doesn't work, Tammy Lynn and Ted try to adopt, only to discover that Ted is considered property, not a person. Everything goes down hill and that's when Samantha (Amanda Seyfried) comes in and takes the case to prove Ted can have rights just as a human does. They have fun with drugs and are immature just like the first and the lines are funny enough to keep watching it all the way to the end. There are other cameos from different actors you know and love and that makes it just as fun. The story I would say is just okay and if they do a third, I hope they can make it better and not dull for the last half of the movie. Don't go in with high expectations. You'll come out disappointed.